I was at the CowBoyBar when there was a thread talking about stuff back when we were kids. 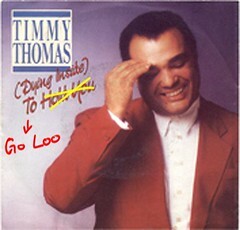 Then there was a mention of this song by Timmy Thomas named "Dying Inside To Hold You". Ahh yes, it was 1993 when the whole nation was singing the jingle over and over and over. No thanks to the radio stations who kept it on the air a tad too frequently. It was a catchy tune that got everyone singing despite it being a crappy song to begin with. Like Lemon Tree, nobody complained back then. I got the song in one of those *cough* cheong *cough cough* CD compilations where I bought in Jurong West market. Yup, I was in NTU then and getting there was just a short walk away from Hall 3. Anyway, it was the night before my Law paper and I was kan cheong as hell that I couldn't sleep. With my body at rest and my eyes closed. My mind was like a rabid hamster high on speed and xtc, running the exercise wheel. Then it happened. My mind started playing the song in loop. I supposed that being a big fan of Wierd Al Yankovic was probably the reason why my mind started to parody the song. So, it's lights back on and I sat down to scribble the new lyrics out. Granted that it was crappy but hey! The song is crappy to begin with and so what worse damage could I do? My mind is warped. I know. Below is a karaoke MV of the song that I found on YouTube. Click here or the play button to hear the song and read the lyrics. Then replace them with mine. Have fun! Warning: The MV quite horriggible one. The imagery, the fact that the words and song don't sync among many other things, may leave you a permanent mental scar after watching it. Proceed at your own risk. I watched already, iBuayTahan. p.s. Btw, I got a C for the Law Paper. It started off, just another day. I woke up and I went on my way. My bus 199, took me to the Spine*. I smelled a fart and I knew it was mine. Standing there, I didn't know what to do. Shouldn't have eaten that leftover stew. And I was dying inside to go loo. I Couldn't believe that the loo was full. Dying inside, I was dying inside. Think I'm gonna have to do it in my shoe. There was this guy in cubicle two. Reading the papers while he push out his poo. He rushed right back in with the Section Two. Think I'm gonna have to do it in my shoe! I can't recall this part of the song that I wrote. Sorry. * NTU has 2 sections. The North Spine and South Spine which is essentially separate wings of the campus. I wonder how many people did actually sing the song with my lyrics? Time to own up! Don't pretend neber hor! Leave your name here! this song...this song...it is so hypnotic...strange desire to click play again. ihawk98: Must be some girl you use the song to bruff her right? ihawk98: Crash and Burn har? wah.. this song very fitting to me right now.. lol..
Gary: Why? You stomach ache now har? Wah piang. So nice a song you write about going to the loo. Win liao. hahaha.. I nearly wanted to say the song too old liao, cant recognise. But apparently I'm not that young. Sigh. Ollie: Ok lah... you still young in my eyes lah. Then again, Lao Chio also good what! eh.. not literally stomachache lah.. you should know.. haha..
do it properly! sing it!!! Akk: Mai lah... how can?? After your Ji Ba Ban rendition, I don't dare liao.... iShy.